I want to report that as of a few minutes ago, we are upwards of $5,500 and pushing towards $6,000 on the rent due March 1st. We remain several thousand dollars behind. We must wire the money to the landlord first of next week. via paypal button on bottom left side of website link panel. 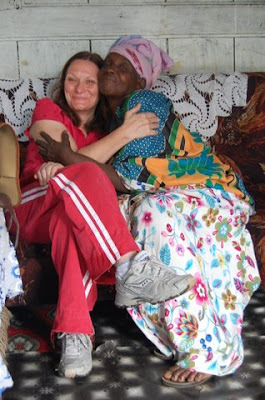 The Nazareth House Family extends around the globe, we are people blended together by compassion, helping those in need, loving our brothers and sisters. It's not an easy feat, to survive in this world we live in - it takes all of us holding each other up. 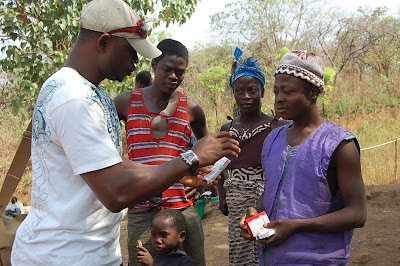 The global outreach of NHA doesn't stop at humanitarian gestures it reaches deeper - forming ongoing relationships. In Yesterday's Blog post, you read about the Ice Storm and how it prompted a gathering of the Nazareth House family to come to the aid of our headquarters in Louisville, Kentucky. Many of you are working hard to come up with the rent to continue the work of Nazareth House another year in Sierra Leone. We are far from reaching the goal of our Landlord's expectations and I am not sure what the future will hold. I can't bear to think of the difficulties James will be facing if we don't come through for him. He has been so faithful in seeing that all the needs we ask him to meet are met, despite danger, exposure to disease, harassment, he does the work. It breaks my heart to even think that we might let him and his faithful family down. The clock is ticking fast and we remain thousands of dollars behind in reaching $10,000 by March 1. 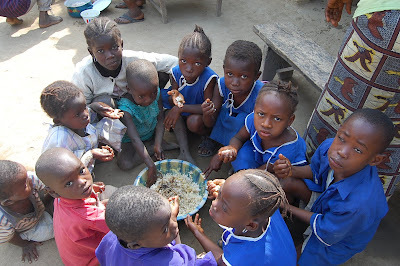 I know that the economy is bad...If you are able, please give today. Whether you can help or not, please invite someone else into the Nazareth House Family. The more we join together the more we can do. Above all PRAY. Nazareth House thanks St. Charles Anglican Church, Huntsville, Alabama for the box of o-t-c medicines that arrived to our Louisville Center on Monday. We are in process of packing it with other supplies and shipping it out this week. James will let us know when it arrives in Sierra Leone. 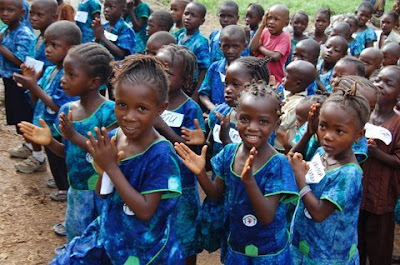 We are still waiting for a shipment of medicine that was sent via One Love Foundation to arrive in Freetown. 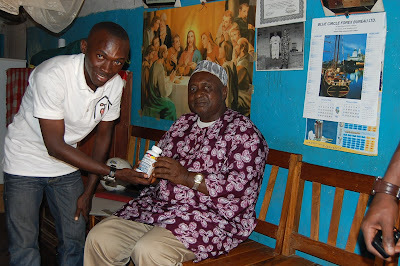 This medicine is specifically for the orphanage we support in joint effort with One Love Foundation. 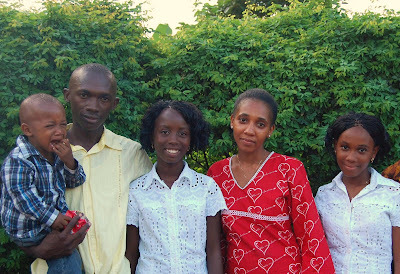 In Freetown, there are a group of people that have become a big part of the Nazareth House Family. 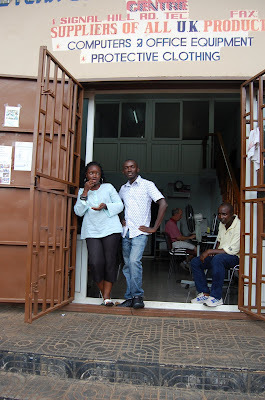 They are the staff at the The Dycar Trading Centre & Internet Cafe that James uses to bring you the wonderful photographs of our work in Sierra Leone. 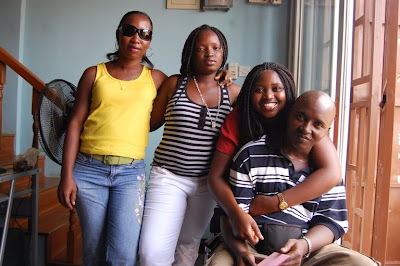 Not only have they become avid members of Nazareth House, they are great friends and helpers to James and his family. They have captured the heart of Fr. Seraphim and I. We love them all. Marian (the newest member of the staff), Betsy, Simithie, and Sanu. Sanu graciously offers us his car to make possible distribution of needs and make our trips to Kabala. He is a true friend - more than that - he is family. I enjoy checking in each day with Betsy, Simithe and Sanu on Facebook. We keep in touch frequently - especially sharing prayer requests, etc. I am sorry for the lapse in posting, there has been so much going on at our NHA Headquarters in Kentucky that my attention has been diverted. But we are hopefully back to full swing. First, thank you for your best wishes and prayers, Fr. Seraphim is resting at the hermitage after hospitalization this weekend and subsequent surgery. All is well, he is recovering. At the onset, I must admit I was frightened and not sure what was in store for him. 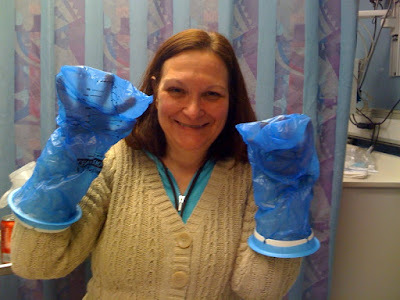 I decided to make the best of the long hours in the ER and put on a "Vomit Bag Puppet Show". Fr. Seraphim is most disturbed he was "out of it" and unable to enjoy the show. Second, if you have not given to Keep St. Laurence House in operation in Freetown, please do so today. 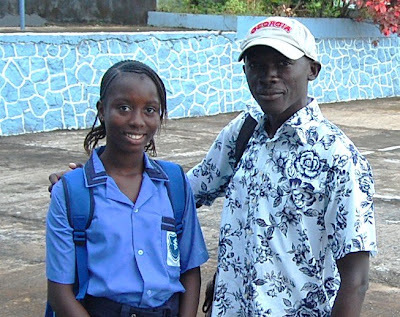 The clock is ticking fast and James and the family in Sierra Leone are poised to be evicted within a few short days. Please contribute to keep our rental operations center one more year. WE NEED YOUR HELP! March 1st is almost here! to help clear the NHA Headquarters' property from the Ice Storm Damage. The place literally looked like a war-zone with trees everywhere. Roo using toy chainsaw like Carroll in Freetown. After a week of hard work and GREAT fellowship the clean up was tremendous. The grounds look 100% better. We really have a great group of people -more like family - working together that make up Nazareth House. 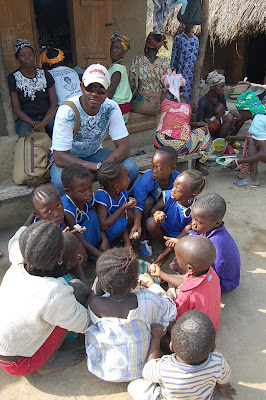 A team composed of people all over the United States blended with the Nazareth House team in Sierra Leone. One big family. and purchased us a new one for the Retreat Center! What a great body of friends this Nazareth House venture has. Caring for each other across borders, across oceans, its what it is all about. Loving thy neighbor. Helping out wherever the need. Child or adult, working together. As always, nights at the Nazareth House Retreat Center (Jonah House) are ended around the fire pit enjoying each others company. 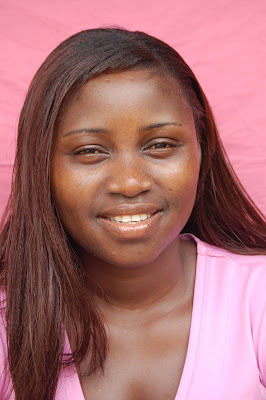 Today in Freetown, James, Kadijah, Lucy and Roo will be celebrating the birthday of our special girl: Ann Marie. Though across the ocean, we here in America celebrate Ann Marie's day as well. She is one remarkable young lady. 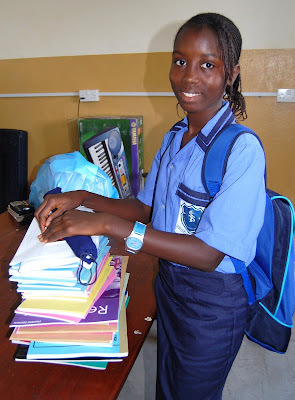 Ann Marie is both beautiful and brilliant and continues to excel in school. Happy Birthday Ann Marie, WE LOVE YOU VERY VERY VERY MUCH! Please scroll down to read more about Ann Marie from a previous post. Another brilliant and talented young lady that NHA recommends that you keep an EYE on is Ann Marie Parker. She was born February 20, 1995. After first staying with us on weekends during early school years, Ann Marie made St. Laurence House her permanent home in 2004. 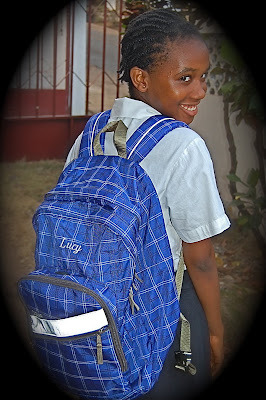 She is fully a part of the St. Laurence House & Mansaray Family in every way. 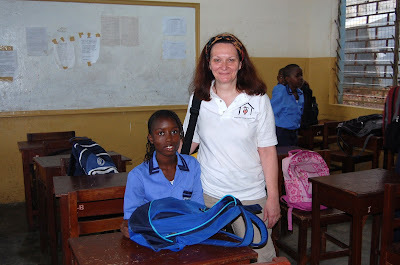 Up until this school season, Ann Marie and Lucy have always been in the same classroom, the same school. Because of their career choices, they had to part ways and go to separate schools this year. 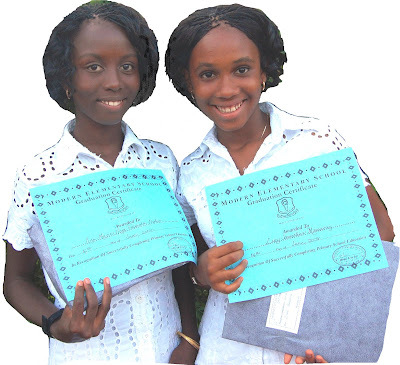 Both girls have continually excelled in their academic studies, repeatedly receiving awards. 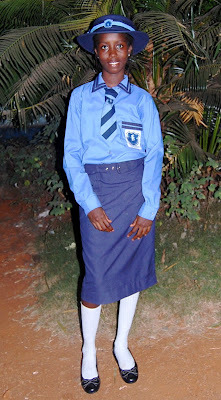 Ann Marie now attends The International School, LTD where she will prepare and focus on a law degree. Can't say enough good about this dynamic young lady. We love you, Ann Marie! Very early one morning while we were last in Freetown, Ann Marie came into the Prayer Room where Fr. Seraphim was finishing up his prayers on his beads. She came in and sat quietly beside him. They struck up a conversation. Fr. Seraphim asked her why she chose to become a lawyer. She told him that "In my country, only the rich, powerful and privileged have lawyers and I want to be a lawyer for those who are poor, those who are not powerful and those not privileged." Before we left to go back to the States, Ann Marie asked Fr. 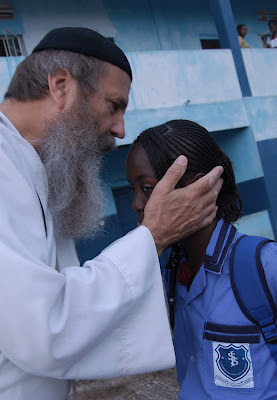 Seraphim to write her a prayer that she could use before beginning her studies each day. We are all delighted to have Ann Marie as a part of the family and are very proud of her. Like Lucy, she is fun, loving and very caring. Both girls, Ann Marie and Lucy are remarkable young women. 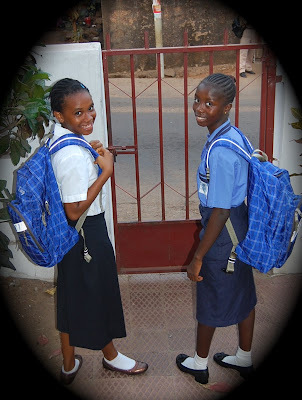 NHA is blessed to have the opportunity to provide the education for these two girls and are proud of them both. They are a credit to their parents, James and Kadijah who have done an excellent job in raising them. (From the looks of this photo above, I do believe it is time for Roo to "face the wall"). Its all Valentine's day here again 2009. So much love in the air here in Mama Salone for lovers and best friends, dear mommy's and daddy's, friendly phone chats and love text messages, flowers to all those who had played a significant role in your life. In few hours time, night clubs, like Old School, Lagoonda and Paddys to name but a few will hit it hard in merry. This sounds good.............. and this is all that life wants, love happiness and sharing in both hard and good times. Having someone around you through thick and thin is important. For many in Sierra Leone, Nazareth House and our work of love have been the only thing sticking around them, especially in the bad times. Today, I met an old man down town. He was buying a piece of candy and a flower. I asked "who are you giving it to?" and he said, "Young man, I saw most people buying it so I thought it wise to get one for myself too so that I be part of it, myself." It was a bit sad he had no-one to share his Valentine Day with, but I loved his attitude that he would not despair, he'd enjoy the day with himself!. This was very funny and it did make my day. Here in Sierra Leone, all of us, one way or the other, have been a victim of bad times and good times. There are those times we cringe when we consider the bad times, but time has made us so we cannot remember how all these pains pierced us and it fades out. That leaves us with fresh smiles that aids us in reaching our goals, leaving the darkness behind and reaching our goals, focusing toward the Light. 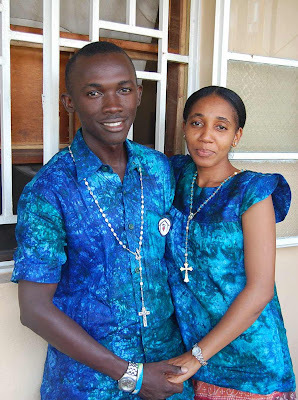 The truth is, as we take a look at the course of Nazareth House Apostolate and its projects in Sierra Leone, you can see that it is a bright light. You are seeing it all right? I guess you like my pictures and real life stories? I love it too. I consider my self lucky doing this to help people. I must admit that most times I am so uncomfortable when I cant meet to all their needs. 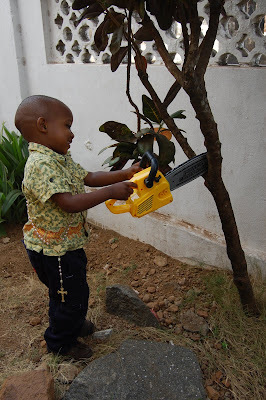 I had been through thorns working with these dusty kids you see everyday on the blog but it is worth it. 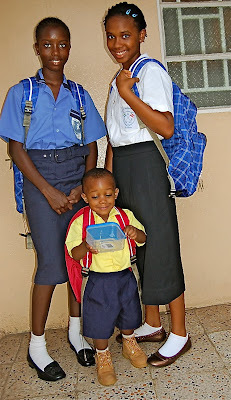 Those shiny and lovely kids you now see in full school uniforms today at our school in Kabala were like those suffering now in the dust just a short time ago. 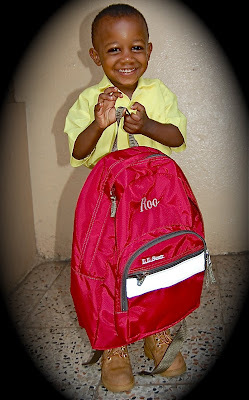 See what the joint effort can do, see the big change in these kids life? The loving, selfless spirituality of Nazareth House Apostolate has taught me to fall in love doing this, helping them out. At first I didn't know what I was doing till I got a taste of it. This is the same way that Alie felt just after a single days tour with me up country. Seeing how hard life is like for these kids you saw with candy canes in the trees and the continuous joy in their eyes made him feel like being a part of NHA and working and helping us out. The same goes for you out there to see a reason for this. You see the needs, you know the work of NHA, so may we all come up strong and join in this cause - make a future for these faces you see everyday on the blog. If many people only contributed a small amount we can do this. I also know there are people out there that are able to give more and still eat 3 meals a day. I for one, have been up since 4:30 AM local Freetown time with mixed feelings about what and what is at hand for NHA like the pressing need for a COMPOUND of ours where we could operate from. The present task of securing another years rent for St. Laurence house so that we can buy enough time to raise COMPOUND money, the suffering and burning needs around us, those to help get good medication, enough food for a day and better education for those we are mingling with. All this is making my head very heavy and my heart is stressed. March 1st is coming quickly. Before I close this one, I have a little girl at heart suffering with an eye problem that needs surgery or she goes blind someday. See what am talking about. Several months back, I noticed a white spot on one eye and now another tiny spot on the other. 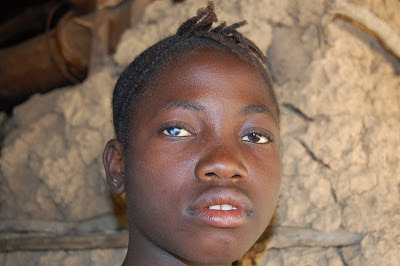 She is only 10 years old and knows nothing but going to the farm, fetching wood or carry palm wine and nothing like school and attention from her mom and dad on how to deal with it. At the end of the day you wont blame the parents for there is no way out for good food lest talking about a scar on the eye. I saw this and placed it in my heart. 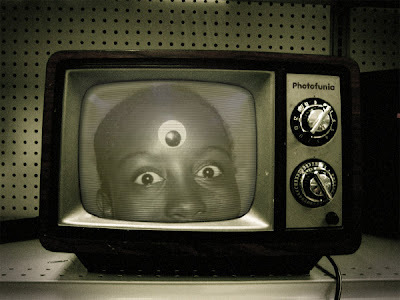 I know NHA is there to do something for her or else her eyes will soon go bad. We all can make this happen. This is just one case , there are tons of it out there suffering the same fate or the other. I am writing this straight from the heart to your heart, hoping to put word in your heart to open up and keep St. Laurence House alive. I thank you for your attention. See you soon. Our "Keep St Laurence House in Operation" Drive has now raised $2,000 (a good start but not nearly enough). We must pay the landlord a year's rent (prepaid) of $10,000 by March 1st, 2009. Please understand, the landlord agreed to extend our lease one more year, but really wants the place for his personal use. If we don't pay him March 1st, we're out the door. That means our staff, our supplies, our medical equipment... all of it! Donations can be sent to NHA at 2216 Goldsmith Lane, Louisville, KY 40218 USA, or made using a credit card through paypal account. A paypal donation link is on the left side panel of our website www.nazarethhouseap.org. You can change the denomination of contribution amount to whatever you like before clicking on the paypal link. Thank you. God bless you all. Unfortunately with all the wonderful photos you see on this blog, we have used up our initial storage space to allow photos. Google gives you 1G of space and as of this morning after over a year on the blog with tons and tons of pictures, we have reached our limit. Early this morning, I purchased 10G more storage, but google tells me it will be 24 hours before I have access to it. Please check back often. It is important. In the meantime, we are still far from reaching our necessary goal of $10,000 rent on March 1st. Less than 15 days from now, if we don't make it...St. Laurence House is shut down and James, Kadijah, Lucy, Ann Marie and little Roo are out on the streets along with all of our provisions for those in need. 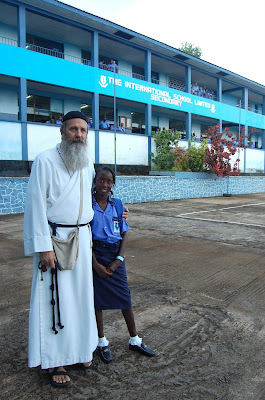 It will be a bitter blow, not only for Nazareth House Apostolate, but for the people who depend on us to survive and move forward in Sierra Leone. When you depend on the compassion implemented through donations, it is difficult to plan. This is the reason that urgent and immediate requests like this pop up for us. We've accomplished so much this year with the little we've received. We have completed construction and opened a school. 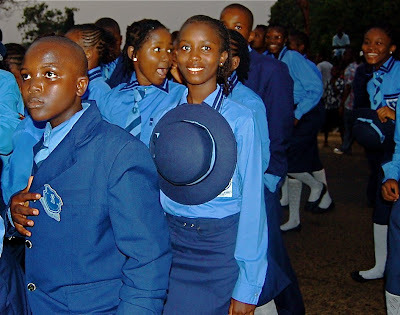 We provided every child with uniforms. Students numbers are increasing daily. Now that the school is open we are maintaining the needs to further and continue. 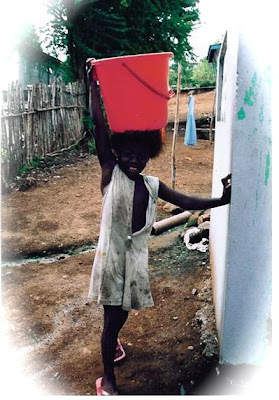 We feed many people in Freetown as well as provide school fees for continuing education, pay hospital fees, provide medical attention and medicines for the sick, provide housing, ...you name it, NHA is doing it. The landlord is firm and posed to take back the rental property if we don't come through. Its not that he is being mean or anything. We made a deal to be out by March 1st (hoping to have purchased our own property); we couldn't raise the money, and the landlord (who wants the property for personal use) was granting us a favor by extending it through 2009. If you remember, he did not want to rent it even in 2008! The donation amount on this link is set at $25, but you can increase that amount (or decrease) before clicking on the link to paypal. As you've been following updates at the NHA blog the last couple of days, you will notice this one young man helping me out. I need not say much about him for your eyes has seen it all. 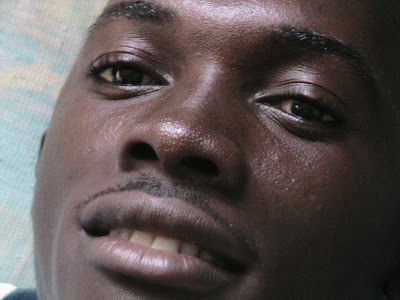 Alie, as he is called, grew up in the Kono District which is in the Eastern Part of Sierra Leone. Our friendship started in the early years of the Sierra Leone war when he fled after rebels stormed his home town. In Kabala he came to seek refuge but unfortunately we all were chased there again by rebels in November 1994. Alie's father was one of the victims who suffered severely after a painful death in the hands of brutal rebels of the Revolutionary United Front. Fear of this and more threats of rebel attack landed Alie in Guinea where he was till he seek refuge in the U.S.A.
We were best of friends, walking through deserted and burnt homes by rebels in Kabala looking for our family members. He was with Abu Bakarr, my late brother, a few hours before my brother was hacked to death with machete by rebels in Kabala. Alie has a good nature about him and makes friends quick. He has always been a friend to my family and kids. He always has time for kids and time to talk and help people even before he went to the States. After tens years he decided to come and visit and see us all. 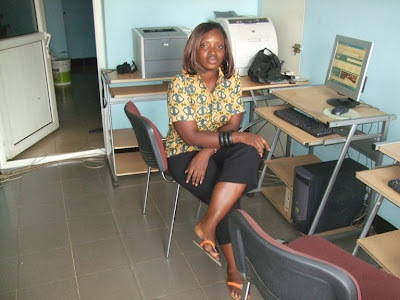 He and I lost communication while he was in the States but on his arrival in Freetown, he visited St. Laurence House and then saw what I am doing. He decided to help in his own way, helping me out with work in and around Freetown, also came with me to Kabala and help the NHA kids. Alie in tears, could not imagine what he has got himself into. He immediately fell in love with the kids, saw the need and placed himself as part of it. He promised to do all he could to help NHA out in his own little way and provided meal for several kids on the road to Kabala etc. Alie brought two suitcases full of clothes and ended up taking just two pair of jeans, three clothes and nothing else. He gave away all his stuffs to people and friends he don't even know. After giving all his stuffs out he started looking into my stuffs for one or two that fits him. I smiled as he gave all his stuff away and then had to use mine. I felt so good meeting him again after ten years and indeed he is a nice JC (Krio meaning a Sierra Leonean that has left and returned "Jus cam". He told me before he left that the work of NHA has moved him more and he so wish to help in any way he could. His girl friend Rugie who lives in Boston after seeing all that her boy friend has done promised to help in her own way too. Can you imagine? 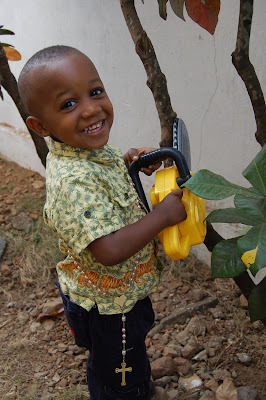 Alie's trip was meant for Holiday and he ended up working and giving for NHA. Alie made time to play and talk with the kids, teach them games and said a little about America and the importance of Education. He was still surprised to see me do all this work here. He was so proud of me and what we are doing. Alie said he never knew what was happening here, he knows about it but was not sure things are still that bad and found them even worst than he expected. Looking at the way people were living he was finding it very difficult to cope. Alie likes food so he asked that I eat good everyday. He was so concerned about my welfare and others, because he saw us slim. He knows we need more help here. He was amazed to see Lucy growing up to be a good girl now. Alie used to take Lucy everywhere with him just for fun. Things were very every here in Salone were bad the time he left. I felt so honored to meet this young man. 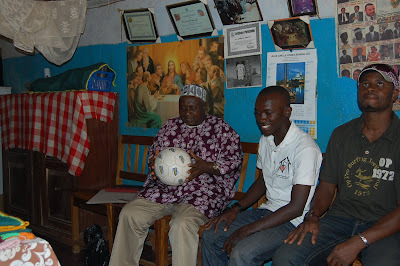 His visit meant a lot to us and the Sierra Leonean community. 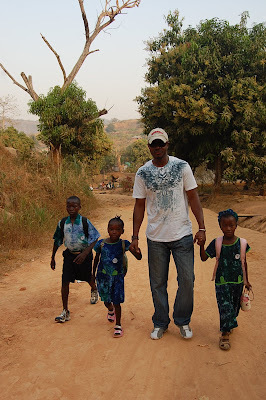 As we make our way to Kabala, Alie stopped at every village giving candy canes and whatever he could to kids. 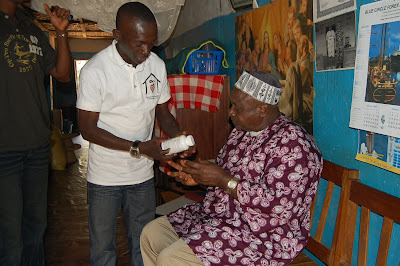 who was complaining of pain and the like so we gave out medication from our Nazareth House stock as well. He was so grateful to NHA. He asks that we continue to do more not only for him but people in his town, I promise to help out whenever I can and with your help I will be able to keep that promise. Last October 13, 2008, I mailed some gifts for Lucy, Ann Marie and lil' Roo. 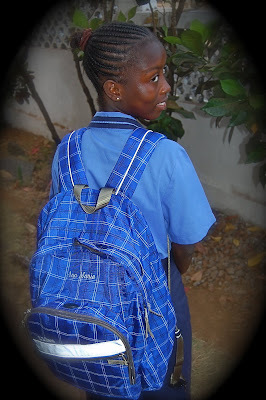 Having witnessed the inadequate backpacks available to them in Freetown, I promised to send them some sturdy ones. My daughters both have their LLBean backpacks from high school that I bought for them in 1996! I had become worried as the long delay in delivery, but as usual the Post Office came through for us again! 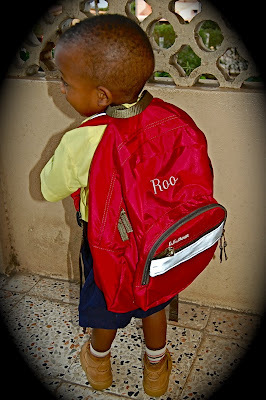 Finally these kids have backpacks to last for many many years and bring them through all the hard avenues of making their way to school each morning and arriving home each night. We received word that Lucy has injured her foot and it is very swollen. I will have more news to report about that soon.